Veronica: Wow, this is actually the first comic since the non-deviantART BCB website was made. 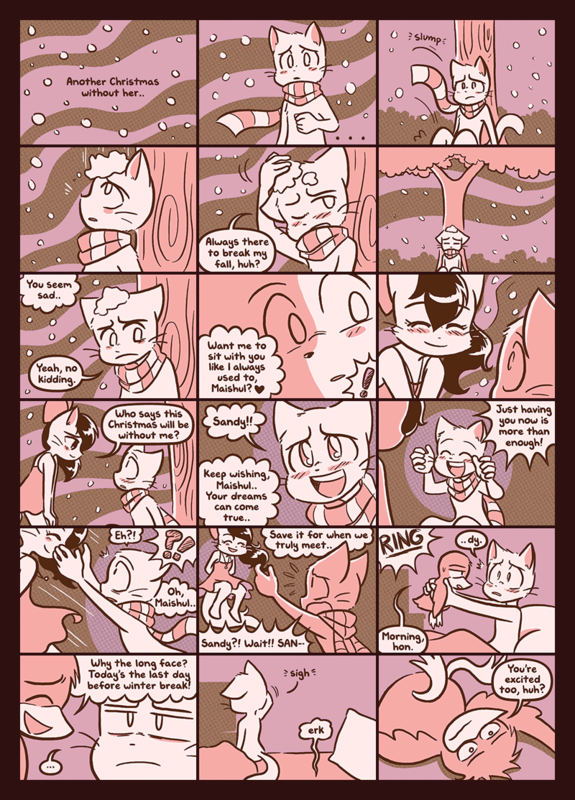 All the other chapters before this were done and posted exclusively on deviantART.. but this is the first comic where Souppy and I have tried to fit it in both deviantART, AND this page. Which reminds me, sorry for not updating in a month. This series is meant to be updated whenever an idea comes to mind.. so sometimes I might post, sometimes might not. I guess it’s just best to check here once in a while if you want. Hey, if there’s something you can look forward to, is that whenever I DO update, it’s not just one page. It’ll always (unless it’s a birthday) be more three pages. Unless there’s a comic done that’s two pages long.. but that’s painfully rare. Anyway.. yes. Starts off quite emo-ish. Mike likes to go through his little phases where he’s beginning to feel doubt. His face looks wayyy too sunken on panel seven.. that one has caught my attention for a while and I tweaked it too much and just gave up on it. I also really really tweaked with Sandy on panel nine, but that turned out half-decent. I need to work on poses.. she’s meant to be bent down.. hope I was successful with that illusion! heh the characters keep getting better with this, and the plot continues without hitting it’s conclusion too soon, while still keeping it juicy enough to keep folks reading. It’s like reading a good novel haha. Rue May 10, 2010, 4:48 PM EST. First Lucy, and now Blur. Mike really needs to watch who he glomps in his [day]dreams. Luigifan October 17, 2011, 12:10 AM EST. Poor guy, it must be incredibly hard to be so attached to somebody. Not that it is particularly a bad thing, but it just must be difficult. The Guy in the Background May 7, 2012, 2:10 AM EST.